"Sometimes the smallest things take up the most room in your heart." ~ Winnie the Pooh. 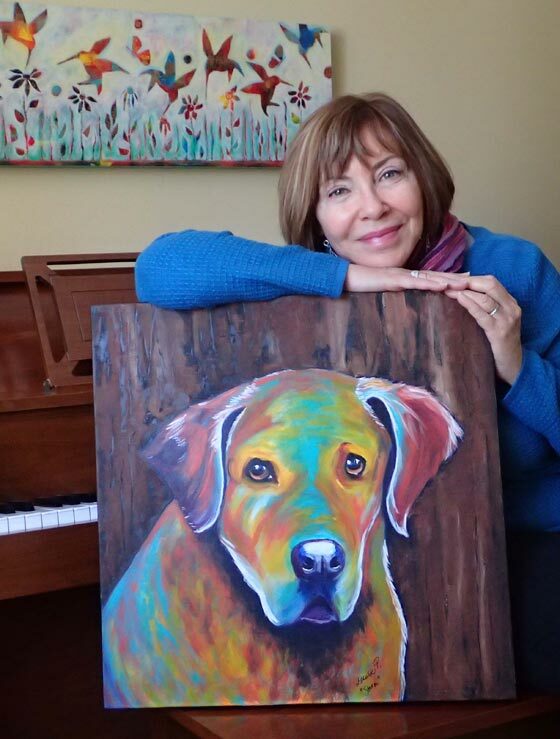 It gives me much joy and satisfaction to bring each dog I paint to life. Tony's expression is so endearing and his pose, leaning against a pillow, tells us that he is a puppy who loves a comfortable, soft spot, preferably close to humans. No wonder these little bundles of fur "take up the most room in our hearts". From this point on, I am concentrating on the details. All colours must be adjusted. The nose and eyes in particular, have to be darker, and I want the blues to be deepened to suggest the creases in his face and ears, and the shading between the front paw and the pillow for example. Tony still needs refinement. By now, I have consulted with Tony's owner several times and sent the progression photos for approval. In this photo, I am bringing in the colours from the background into Tony's fur. I want more of the green to be visible, but I am also adding touches of Naphtol Red Light and Sienna as well as Titan Buff and Titanium White. There are too many adjustments to show in photographs. It is a constant push and pull of colours, emphasizing certain colours in areas of the fur while allowing other colours to recede or to be softened depending on what I find pleasing. The sides are always painted in a colour to match the portrait. As the orange pillow in the portrait does take up quite a lot of space, I carried that same colour over to the sides. Finally, I can step away feeling satisfied. Tony is done and I like the effect of the greens and blues in his fur. For some reason, the pillow is much brighter in this photograph than it is in the painting itself, and although I compared scanning to taking a photograph of the painting, the results remained the same. The colours are truer to the portrait in the above photo (taken with my Ipad) where you can actually see the folds in the pillow. For information on commission paintings, please contact me at louiseaprimeau@gmail.com. I am accepting limited commissions up until November, in time for Christmas gift giving (and for enjoying the surprised reactions from your loved ones! ).